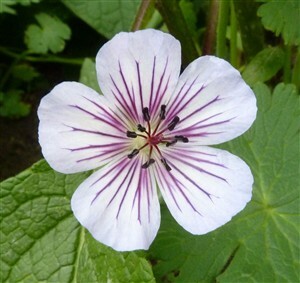 Geranium 'Crystal Lake' A fabulous new introduction that was much asked about in the garden in its first year year (2013). Good sized shimmering, almost opalescent, light powder blue blue flowers with radiating dark purple veins continuously from July to Nov. Excellent low growing, front of the border plant. Sun or part shade.